The DCI Orlando event on Saturday, July 11 at the Florida Citrus Bowl had a little bit of everything to offer the fans that made it out to the show. Sunshine, rain, a rock band made up of Teal Sound members, and of course a healthy dose of drum corps performances kept fan busy until late that night. The all-age Sun Devils opened up the night's competition, but were only able to perform for a few minutes until their show was cut short due to lightning. They were cheered on enthusiastically by thousands of fans through their first rain drenched performance. Heavy rain inundated the stadium for the next few hours as fans, corps and staff waited and hoped for the weather to clear. After a conference with DCI Contest Coordinator, Tony DiCarlo and corps directors, it was decided that for the safety of the corps, the evening's event would be limited to standstill performances. As the event finally got under way, the Sun Devils returned to the field with nine other corps to put together a collection of their 2009 program music, encores and various other selections. Fans were the biggest help throughout the night as many weathered the storm to cheer on the corps. A great energy emanated from the field on that night. The corps seemed to be glowing with anticipation while showing the crowd what they came for, despite the letdown of not performing their full productions. Although the competitive aspect of DCI Orlando was no longer an option, the corps gave the audience performances worth waiting for. 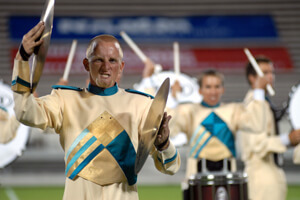 No scores were given for the standstill performances, but the corps and their fans both left the stadium that night with a sense of satisfaction about the event. View photos from DCI Orlando event Photos by Craig Olear.